When you are choosing a window contractor, you deserve to work with the best team in the industry. In fact, the most important decision that you can make is to choose the right contractor for the project. If you are working with a company that has built a good reputation, then you will have the peace of mind to know that you will receive a high-quality product. Reputation matters. Working with a company that hasn’t established a good reputation means that you might receive low-quality materials and installation. Why spend the money on these investments if they aren’t going to be done right? Before you hire a contractor, it is always best to look at their reputation and see what other people have said about the services that are offered. Reviews from past customers can shed light on the experience that you will have if you choose to hire the contractor. Here at Brock Doors and Windows, we offer expertise that you can trust. We are known as one of the leading contractors in the windows and doors industry. We will work hard to be sure that you receive the high-quality services that you deserve. Just because someone has worked as a contractor for many years, doesn’t necessarily mean that they have the right experience with window installation. Don’t choose a “jack of all trades” contractor to help with window replacement. Instead, it is better to choose a contractor who knows the best products and services in the industry. Brock Doors and Windows has been in the industry for over 26 years. During this time, our team of over 100 committed employees has completed over 70,000 quality installations! We know what works, and we want to offer these experienced services for your home. Customers have been choosing our services for decades, and they continue referring their friends and family for our window services. As you read through our customer reviews, you will see that each customer is completely satisfied with the service that we offer. We are dedicated to customer service, and you will see that dedication in the quality of work when we are done. 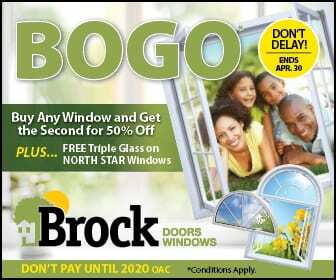 At Brock Doors and Windows, we want to help you see why we are the leading windows contractor in the area. We stay up-to-date with all of the latest trends in the industry. Our team works hard to offer the best services that are available, and we want to be sure that you love the results when we are done. We will talk with you about your goals for the project, then help you choose the products that will fit your individual needs. For more information about our services, we invite you to call us today at 1.800.449.3808. You are also invited to visit our showroom in Toronto at 2131 McCowan Rd, Scarborough, ON M1S 3Y6, Canada. We also have a location in Brampton at 278 Orenda Rd, Brampton, ON L6T 4X6, Canada.